Yesterday the festival came together in Alumni gym for a contact jam. For about an hour and 15 minutes the space was open to connect, reconnect and get to know one another. Nancy Stark-Smith started by inviting everyone onto the marley to begin warming up with a partner. 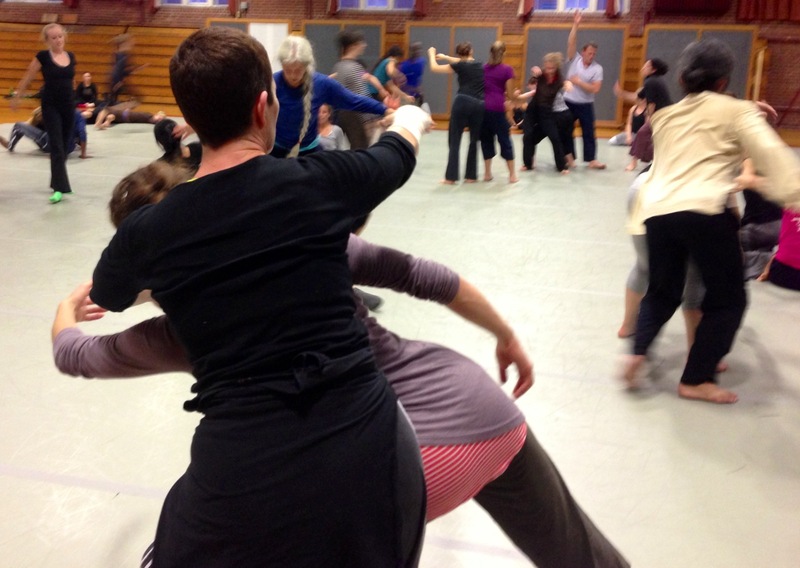 Using gentle motions we massaged each other into movement using all of our body. Hands, feet, backs and heads were tools to warm muscles and manipulate a partner’s movement. Soon little moments began to build in momentum and virtuosity. Those interested in watching, gathered around the sides of the space to witness the magic. People came in and out of the movement, changing partners, connecting with a new group, exploring an idea on their own. The room built in energy until the whole space was filled with a chaotic jumble of fluid bodies. What a great celebration of movement during our first week of classes. I can’t think of a better way to get to know people. People who I had seen around the festival at lunch, in class and at events were there. But I now had an opportunity to roll, push or balance on them. I got to know many people better simply through that touch. And how profound that touch feels. Strangers are no longer so foreign, now that I’ve seen them dance and touched their bodies. For that time we were connected not only by cause but by physical touch. The last 30 minutes were the most exciting to watch and participate in. Freed of inhibitions dancers began to really explore the boundaries. Pushing and pulling each other through the space. Torsos and legs thrown into the air. 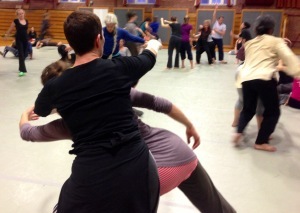 Whole bodies twirling over shoulders. Intense energy bubbled up in an effort to truly live in the moment before it ended. Sweat dripping we puddled onto the floor in the last few minutes. Finding a last way to connect with a partner to stretch out our tired muscles. The joy and electricity created in that room was hard to leave, but could continue to be seen on the faces of those leaving the gym. Big bright eyes and genuine smiles along with a sheen of sweat covered our faces.